Frequent road trip travelers know how difficult it is to pack lightly. With this Dee Zee ladder rack, you won’t have to worry about running out of space and leaving anything behind for your next adventure. 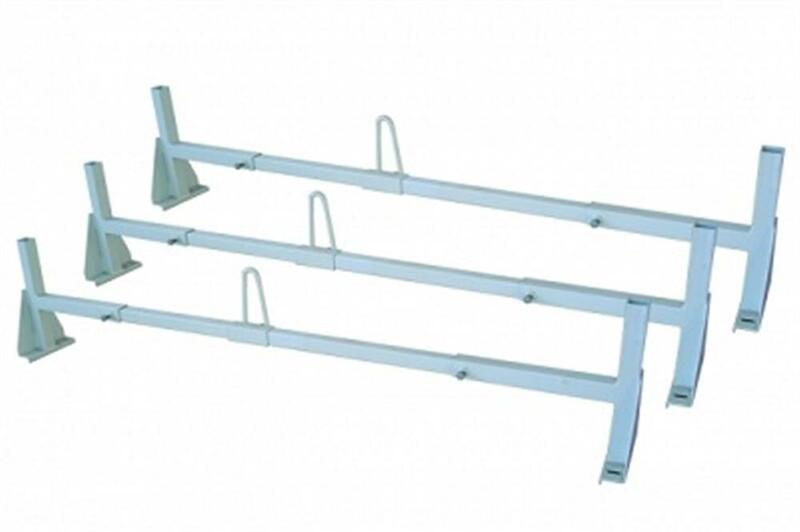 Coated in premium white paint, this van ladder rack is an excellent addition to your van’s set-up. Arriving in a set of three, this component lets you add even the longest and widest items to the top of your vehicle. Hitch luggage, skis and canoes without worrying about losing your items. This item fits all full size vans making this a universal ladder rack for most van drivers. Each can be maneuvered to a customizable fit for a tight and secure hold. Its hard-wearing steel components prevent breakage after many miles on and off the road. Other types of ladder racks prove an unsightly addition to vehicles. However, this sleek design is topped with white paint with a superior powder finish for a look that is worthy of praise. Each feature of this component combines for a first-rate ladder rack that is ready to join you in every journey to come. California Car Cover offers a wide selection to suit a vehicle owner’s dreams. Search for bike racks, mirrors and truck covers for sale in our online catalog to create your fantasy vehicle. Pick up your tonneau toolbox or several car care accessories in addition to your newest ladder rack today.